We hadn’t realised how many people want a nice place to stay within easy reach of the ferry from Fishguard over to Ireland, but our bed and breakfast in Laugharne fits the bill. 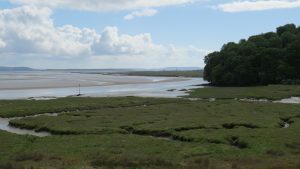 We’re less than an hour’s drive from Fishguard, and have plenty of places to eat and drink within walking distance of our front door in magical Laugharne. And not many b&bs have a castle view, but ours is just over the road from a 13th century castle. You can climb to the top and enjoy panoramic views over the estuary, not to mention Dylan Thomas’s boat house where he wrote many of his later works. Next time you’re coming or going from Rosslare to West Wales think of the Boat House b&b in Laugharne, it’s a great stop on the way, arguably worth a special journey. But then we’re a bit biased. Here’s a shot from the top of Laugharne castle.